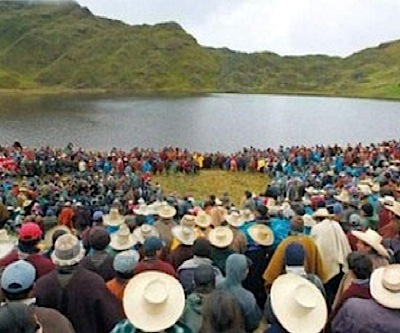 Opponents to Newmont Mining ‘s (NYSE:NEM) $5 billion gold and copper Conga mine in Peru staged a massive demonstration Monday evening to demand both the company and the country’s authorities to stop work on the project, including the building of water reservoirs. Local TV showed images of thousands of farmers and miners marching toward El Perol lake, one of the main water sources they depend to drink and farm, which they believe will be negatively affected by the project. Newmont has repeatedly said it will only move forward in a socially and environmentally responsible way, as the open-pit project involves moving water from four lakes high in the Andes mountains into reservoirs the company is planning to build. The Conga project, located roughly 3,700 meters above sea level, was approved in 2010 by then-president Alan Garcia's government, and the current administration has continued to support it. Only yesterday local paper El Comercio (in Spanish) published an interview with Energy and Mines Minister Jorge Merino, who said the Conga project would definitively proceed, but added the company still needs a "social license." "The government will support private investment, but we can't impose a forced decision unless there is a majority in favour of the development," Merino was quoted as saying. Construction at the debated mine, in partnership with local miners Buenaventura and Minera Yanacocha, has been suspended for over a year after violent protests and blockades routes in and out of Cajamarca forced the government to declare a state of emergency in more than one occasion. Conga is set to begin production in early 2015, but last April Newmont stressed willingness to reallocate capital to projects in other countries such as Australia, Ghana, Indonesia and the US. The mine will be capable of producing up to 350,000 ounces of gold and 120 million pounds of copper per annum with a 19-year life of mine.